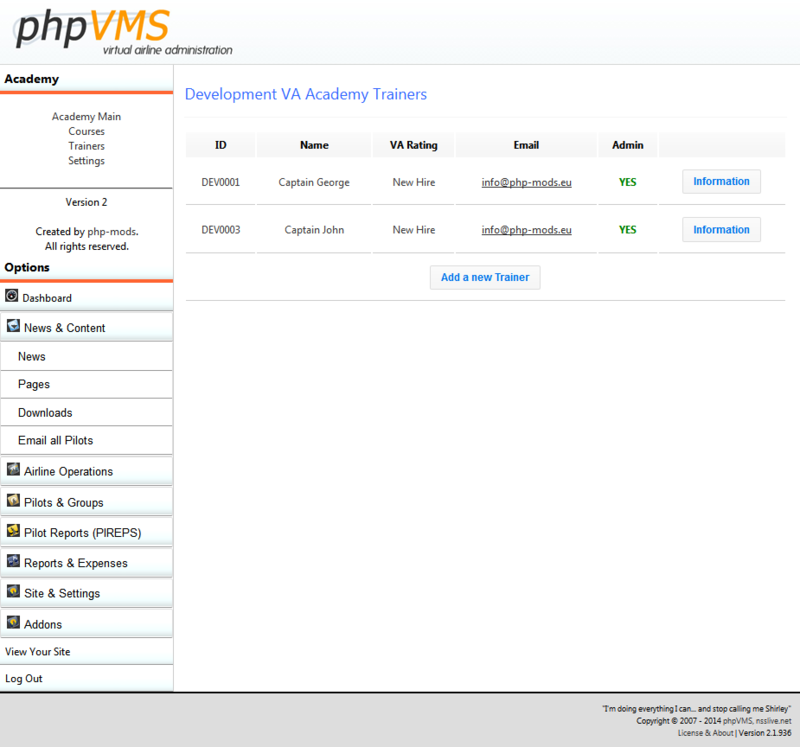 Pilot Academy Module has been developed by PHP-Mods in order to help you organize your pilot trainings and exams on your virtual airline website. Compatible with phpVMS only! No refunds! 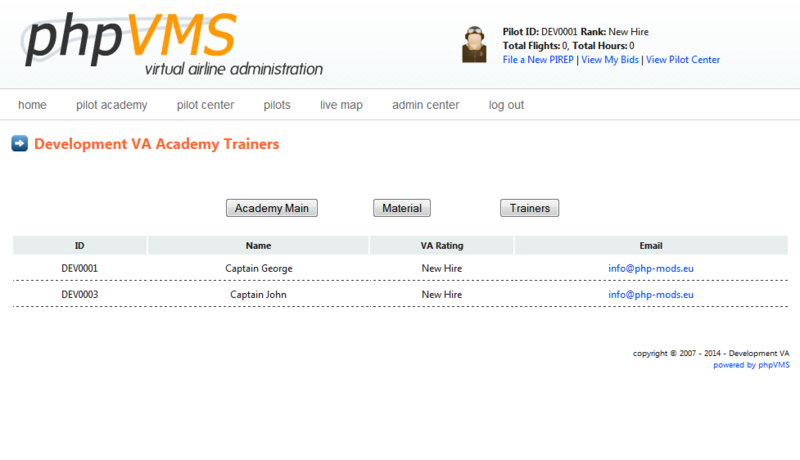 Create specific training courses and set a minimum rank which has to be gained by the pilot in order to request the course. Build-in communication system between the trainer and the trainee. The trainer can assign theoretical and practical check-rides on each course in order to check the trainee's learning progress. 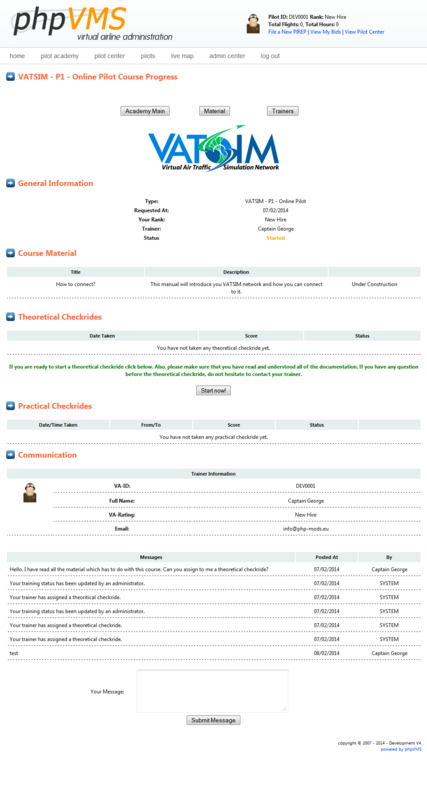 Theoretical check-rides include a specific number of questions and have to be submitted on a specific time (these can be set by the settings page). 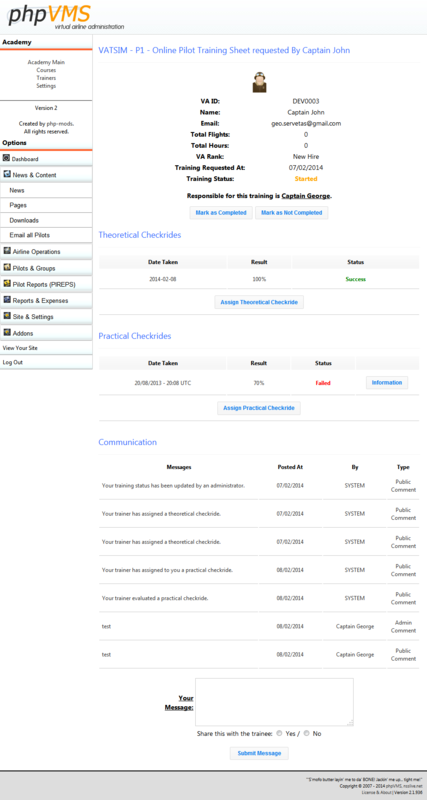 Theoretical check-rides are being evaluated instantly based on a passing grade which can be set by the settings page. Integrated with simpilot's Pilot Reward Module for those who have installed it. 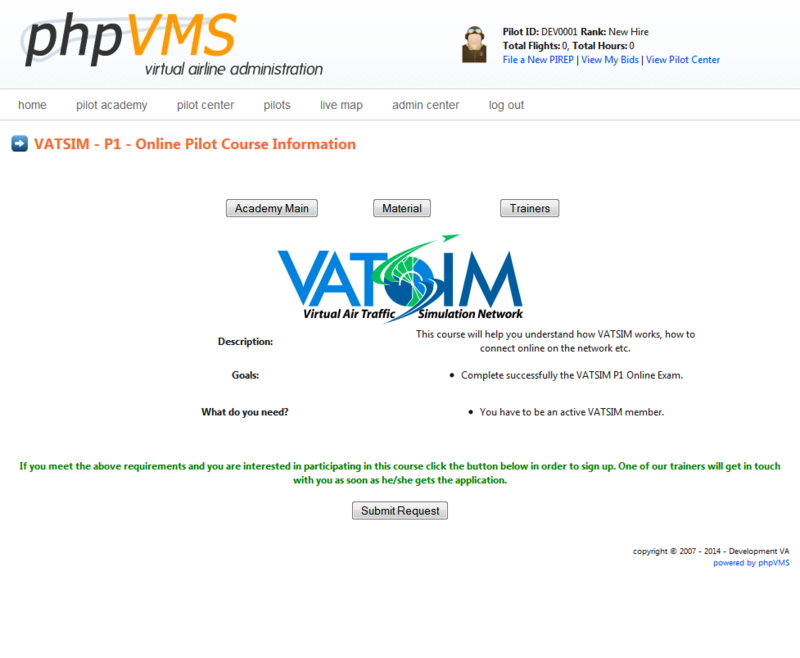 Using an API Key from the VATSIM Pilot Training Department, it is possible to assign a VATSIM Rating automatically as soon as a training is being completed. 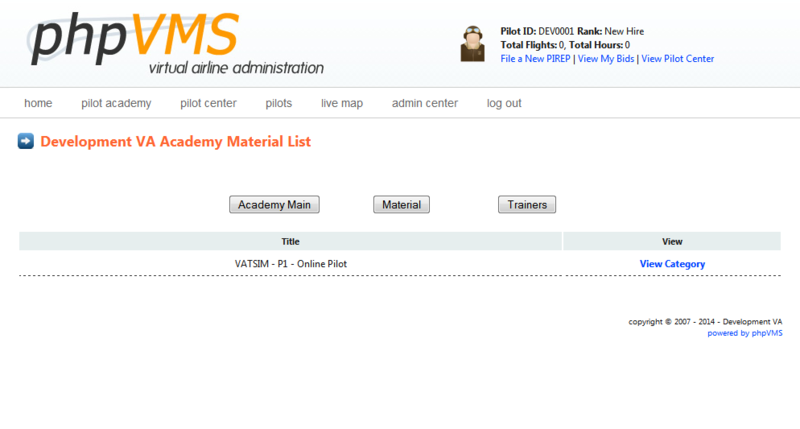 Pilot Academy System meets all the VATSIM standards for an Authorized Training Organization (ATO). 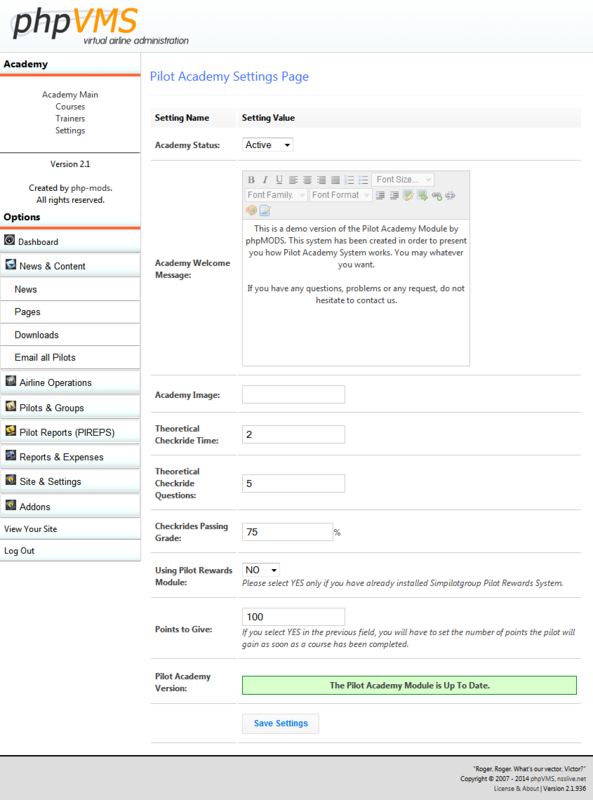 The following installation steps have to be followed by those who have never installed any version of the Pilot Academy Module. 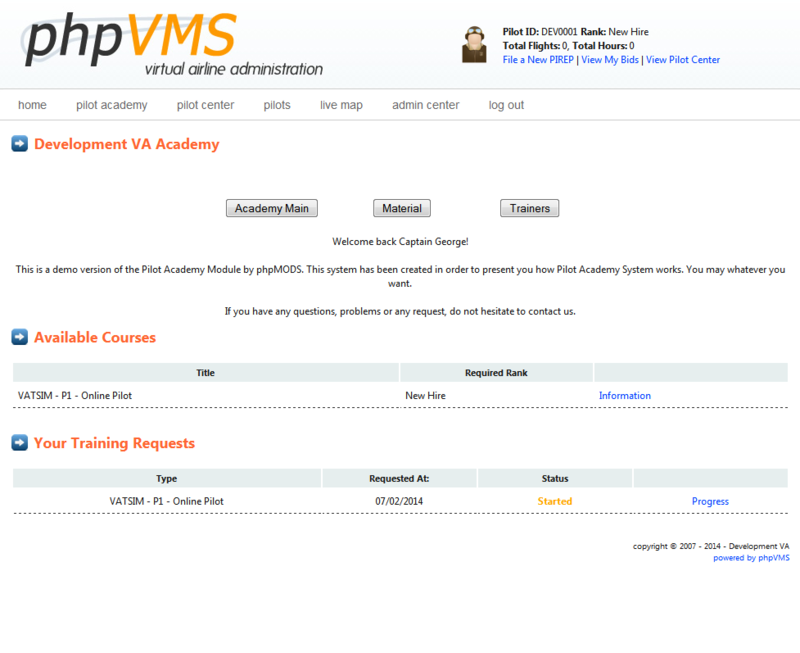 Unzip the Pilot Academy File you downloaded from our system. 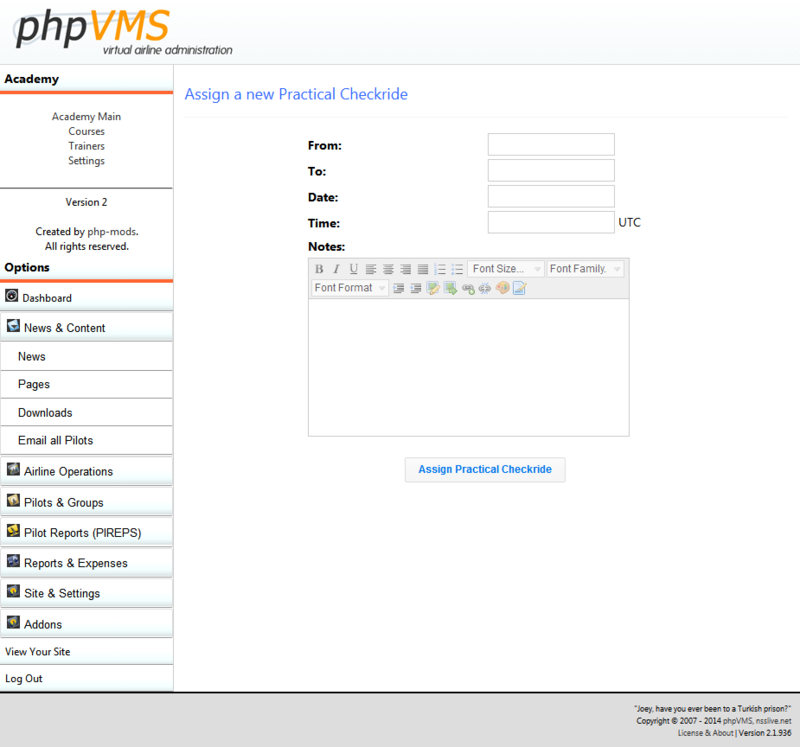 Upload the files same as the structure of your phpVMS files. 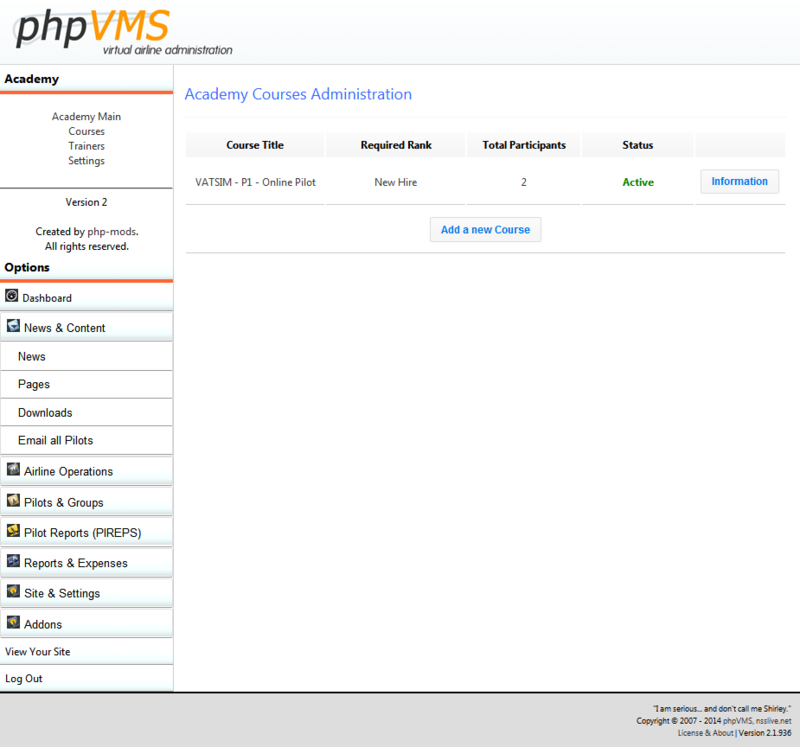 Go to www.youdomain.com/AcademyInstallSql in order to run the AcademyInstallSql folder. This will install all the database tables. 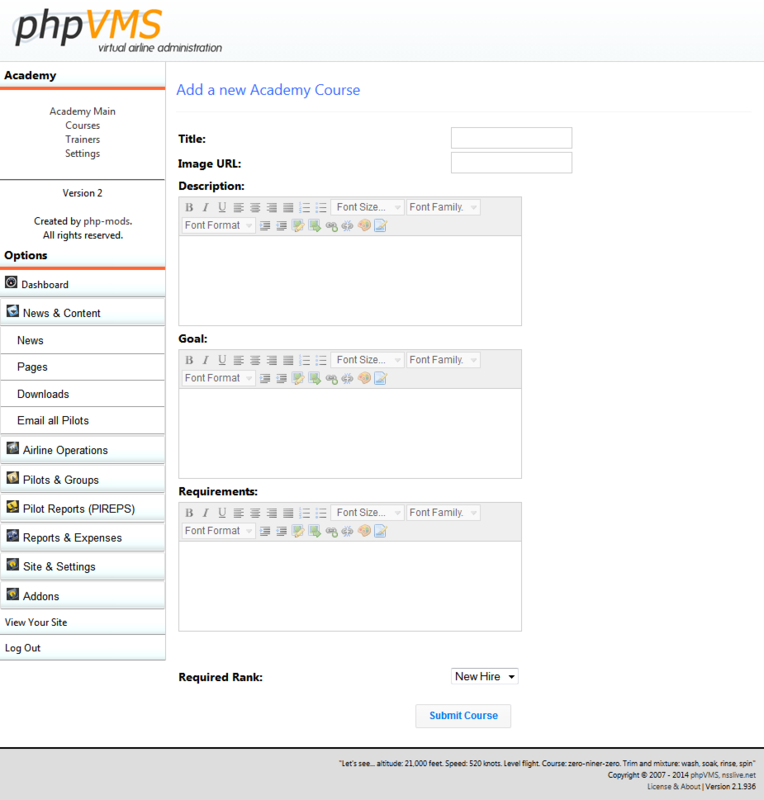 After installation is completed, do not forget to delete the AcademyInstallSql folder from your server. 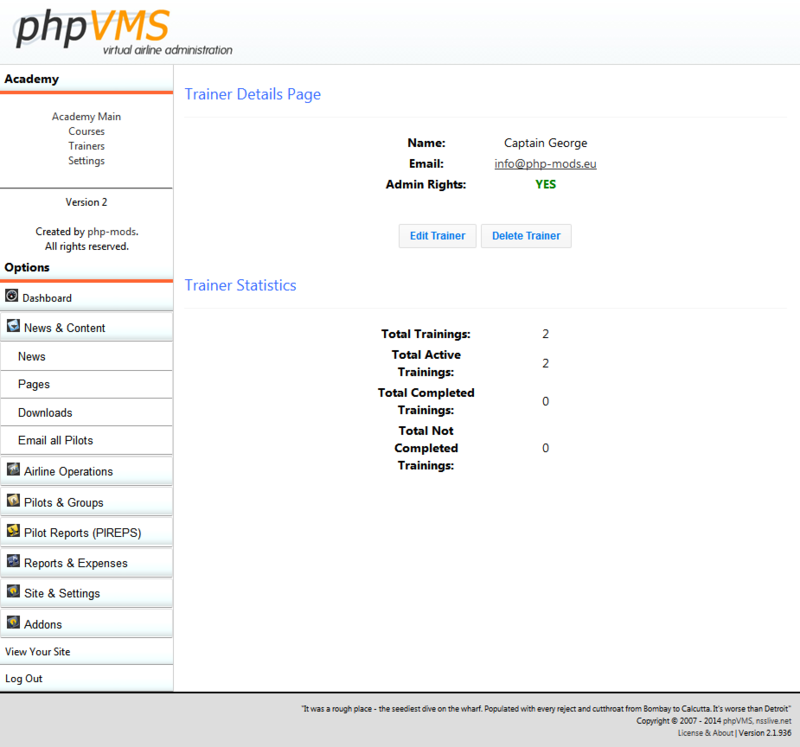 After the installation, a link will appear automatically in the add-ons section of your phpVMS Admin Panel.